University of Jammu started M.sc programme in Information technology from the Session 2010-11. There is a Administrative Block and a Faculty Rooms. The distance of Kishtwar from Jammu is 230 kms. 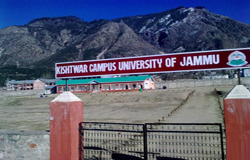 The Campus is located near Degree College Kishtwar. Kishtwar is bounded on the north by Kashmir and Zanskar Valleys, on the south by Bhaderwah and Doda, on the east by Himachal Pradesh and on the west by Anantnag and Ramban Districts. Kishtwar district branches off in four valleys of Marwa, Warwan, Padder and Chatru with their terminal at Kishtwar town. The Gateway to Dachhan is Ekhala and Hanzel to Marwa Warwan Valley whereas Lidrari is Gateway to Padder valley and Dadpath Chatru Valley. In 1904, Islamia Faridia Primary School was opened for the children of Kistwar. The dignitaries that were responsible were Khwaja Khazer Joo Agoo, Syed Amirullah, Pir Saifudin, Khwaja Nasrullah Haf, Khwaja Ghulam Rasool Kripak, Abdul Subhan Agoo, Ghulam Rasool Kamgar, etc. Mr. Nandlal was the first Head Master of the school. The school runs by private donations and government funds. In 1943, the school was upgraded from Primary to Middle School. The new head master was Mr. Noor Din. Then in 1967, it was upgraded again to High School. From 1946-1986, Mr. Ghulam Rasool Hamal was the Head Master. He dedicated his life to educate children of Kishtwar. Many of his students that have graduated from the school are famous Doctors, Engineers, Professors, and etc. He is respected in the field and around the town. Another teacher, Mr. Ghulam Rasool Dar, has dedicated his 35 years of his life. In 1980, Mr. Abdul Wahid Kripak and Mr. Abdul Kabir Kripak added a new building for the school.and renovated the old building. Many students have come back and served for the school. Few are teachers and few help run the school in the management. One of such person was Late Mr. Bashir A. Kichloo. He served as a Cabinet Minister for the Jammu & Kashmir. As a Chairman of the Auqaf Islamia, he worked hard to improve the school. He renovated the whole building and added separate building for the girls. He also added science laboratories, computer room and Library for the new generation of Kishtwar. Because of his dedication and hard work, this building is one of the best in the town. When you enter in the school, you can see the difference he has made to the school. For this and many reasons he will be missed. Every year during the month of November 10-12, there is a celebration where the students perform for the dignitaries and alumni of the Kishtwar. The school proudly celebrated its 95th anniversary in 2000. I started my studies in this school in 1980 as a 6th grader. I wanted to fulfill my maternal grandfathers (Mr. Sanaullah Rathore) dream. He had also dedicated his life as a teacher in this school. I exceeded in my studies as well as learned Islamic teachings. I also took part in the cultural events. I graduated in 1985. I then went to further my education in government higher secondary school in Kishtwar. After that I went to Jammu College for further studies. I would like to say thanks to few of my teachers who helped me achieve my goals. They are Mr. Ghulam Rasool Hamal, Master Lashman Das, Mr. Mohd. Abdullah Malik, Mr. Chunni Lal Goswami, Mr. Ghulam Rasool Dar, Mr. Abdul Rashid Sheikh, Mr. Ghulam Nabi Gundana, Mulana Abdul Bari, and Mr. Sri Krishan. Few of my dearest friends that had graduated with me from Islamia Fraidia School were Syed Arif Hussain, Wasim Bashir Dev, Khalid Abas Munshi, Tariq Masood Sheikh, Farooq Ahmad Kandoo, Gulam Haider Sheikh, Abu-Lais Gagroo, Ishtaq Husain Waza, Sajad Hussain Ahanger, Sajad Ahmad Malik, Wasim Ahmad, Shafqat Hafiz Munshi, Ibrar Ahmad Moghal,Haq Nawaz Sheikh,Mohd.Iqbal Rangraze,Ajaz Ahmad Kichloo, Shabir Ahmad Dar, etc. Most of these friends have become professionals and are well settled in their lives. I will always remember them and cherish the moments that we had spent at Islamia Fariadia School. The instituation Bharti Vidya Mandir was established on Feb,17th 1974 at Hidyal Village.For last 17 years the institution has been functioning smoothly and conceding a perennial,solid contribution to noble cause of education.A brief account of the Honour’s and Achievements are given here to highlight the relevance and objectivity of this mission of service and education. From the every begining the institution is facing a tremendous pressure due to increasing demands of admission.Inspite of tough and tight admission,today there are nearly five hundred students in the school as compared to 1974,when the institution was started with 30 students only.Nearly 200 students are in the waiting list today. A number of children have been rendered orphans since their families have been wiped out by the terrorists. There are a few other children also whose parents have died and are homeless. At that time there was no infrastructure existing at Kishtwar for rehabilitation of these children. There was thus an urgent requirement to provide an orphanage at Kishtwar where these children could be rehabilitated and provided necessary boarding and lodging. The arrangements to impart the necessary education also needed to be worked out in consultation with the Civil Administration. The requisite land for the project has been provided by the civil administration. The cost of the subject project is Rs 15 lakhs. The structure comprises of one living hall for 30 children, one room for administration staff, one dining hall with cook house, and store with verandah and boundary wall. All electrical and sanitary fitments have also been provided so as to make the hostel functional in every aspect. The management of the said hostel has been assigned to social reforms and Charitable Organization (SRCO) w-e-f 23-01-2005. Initially SRCO ensured and shoulder all the responsibilities with out any support/financial help from any quarter. At present 25 beneficiaries are enrolled in this hostel who is accommodated with all the necessities likewise Boarding/Lodging, education, Health, Games, Clothing. SOS children village of India has been kind enough to provide assistance by way of meeting the expenditure of mess for these beneficiaries to some extent and other deficiencies are being arranged by the organization on its own. SRCO is providing free education to all these inmates in different Govt/Private institution of its own, beside all this two part time highly qualified teachers Amer Jeet Parihar (M.A. Sociology) and Taskena Begum B.A (M.ed) have engaged to provide tuition facilities to these inmates. Moreover, stress is being made for moral education anhd earning good name both for themselves and contribution towards the society. SRCO has hired part time services of Dr. G.M.Naquib senior B>Grade specialist and weekly checkup is being conducted at hostel premises and free medicines is being provided if required. Games like Cricket, Volley Ball and other out door games are being played by the inmates of this hostel under close supervision of Hostel staff headed by physical education teacher Mr. Yash Paul Kotwal. Uniform and other cloths according to the feasibility of the seasion are being provided by the organization to these inmates from its own sources. This organization has proposed vocational training courses like computer education to the student in order to made them selves sustainable and full Skilled to earn their livelihood by way of adopting self employment schemes and also to avail the opportunities adjusted in various services.